Not the best start to a walking day. 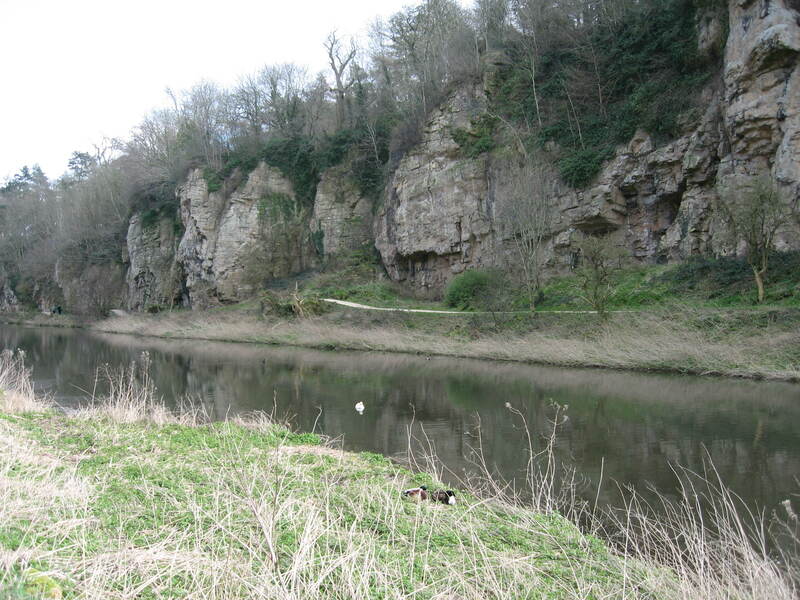 Kath and John led 16 in pouring rain from Creswell Crags Visitor Centre for a 7.5 mile circular. From the Crags they moved off around the quarry to Whitwell village – then over the fields to Hodthorpe, and then on to Belph before returning to Creswell. The weather did improve as the day went on and they did manage to have lunch in the dry. All in all not too bad a day. Just seven of us set out from Mytham Bridge on a rather wet and misty morning. We had a circular, low level walk, around the Hope Valley,via Brough, Castleton, Aston and Thornhill. In an early lunch stop in Castleton we took advantage of shelter from the rain. However, weather improved in the afternoon and we saw glimpses of a watery sun. Part of the walk was though woodland with glowing autumn colours. Passing through Bamford Garden Centre at the end of the walk, it was a unanimous decision to call in for tea and cakes. Despite the dire weather forecast at the start of the week 14 walkers took the bus to Matlock for a linear walk to Bakewell and were rewarded with a fine day. We set off beside the river following the Derwent Valley Way to Darley Bridge for a coffee stop, before beginning the long climb up to Birchover Quarry and Stanton Moor. After lunching with the Nine Ladies we descended through Stanton-in-the-Peak, and then crossed fields to walk over Haddon Fields into Bakewell. There were many good views and the lucky (and more observant) members of the group had two sightings of deer on the way. Total distance just under 10 miles. The October walk with the visually impaired was led by Barbara and Ken in brilliant autumn sunshine. A circular from Over Haddon, taking in Lathkill Dale and Bakewell, before returning to the start for tea and cakes at the local café. On a beautiful autumn morning 33 walkers set off from the lay by next to the Grouse Inn for an 8.5 mile walk along the Edges (Curbar, Froggatt, and Baslow). Then down into Calver village to walk along the River Derwent to Froggatt, and along the bottom of Haywood to Grindleford. Thus far the walk was either flat or downhill, but now for the sting in the tail – the climb back up through Haywood to the lay by at the top. The morning break was taken on Curbar Edge with wonderful clear views and lunch was taken on the banks of the Derwent. The Wednesday ‘long car’ gang were closer to home today. Cartledge Hall, Monk Wood and Unstone. There were 15 of us on the Dronfield Footpaths Society / Ramblers’ walk I led this morning. The start was at St Andrew’s Church in Dronfield Woodhouse, where we enjoyed coffee and toasted teacakes before we set off on a 5 mile walk which encircled Holmesfield. Our route was through Kitchen Wood to Cartledge, where we enjoyed views of autumn colours across the Cordwell Valley. Then on to Holmesfield Common and back round to Dronfield via Rod Moor and Mickley. A dull cool start give way to light drizzle, but the sun soon came out to give a very pleasant morning for the walk. Our next Tuesday morning outing will be on 17 November, starting at 10 am from Holmesfield. It was the BBC Countryfile Rambling weekend – but we already have a programme of regular Saturday and Sunday walks for those who want to walk every weekend. Thanks to Shirley who led an 11 mile circular from Bolsover in beautiful weather. The first of the Saturday car walks in the winter programme saw Graham and a group of nine walking 10 miles from Monsal Head via Brushfield, Litton, Tideswell Dale and Cressbrook Dale on a cool autumn day. An excellent walk attended by four of us in brilliant weather. The walk distance was 10 miles and included Hitter Hill, Hollinsclough, Hollins Hill, Chrome Hill and Parkhouse Hill – with a return to Earl Sterndale and the ‘Quiet Woman’. Two of the bunch were new to our group, John and Robert, who had never been to that area at all – the other walker was Janet from Derbyshire Dales. Photographs from the two Johns …. The weather was great, visibility fine throughout – five of us travelled via Calton Green, Grindon, Thors Cave in the Manifold Valley to Wetton, Alstonefield (and the “George”), on to Castern Hall and Bunster Hill – before returning to Ilam. 18 Miles and just under 3000 feet of ascent completed in just under seven hours.